Tom Cruise is nearly 50 years old and doesn't let age stop him from being the most batshit crazy actor working today. In a 10-15 minute thrilling sequence at the Burj Khalifa (The world's tallest building), Cruise throws caution to the wind and does his own stunts climbing and running across the outside of the building. The sequence which looked unbelievably awesome in true IMAX projection is the highlight of the latest Mission: Impossible film. Mission: Impossible - Ghost Protocol is the fourth film in the series that follows agent Ethan Hunt and his IMF team of technically saavy espionage experts. The movie plays out very much like a sooped up James Bond film with Cruise and new partners Jeremy Renner, Simon Pegg and Paula Patton teaming up to take on a complex terrorist plot that spans the globe. In some stunning on-location settings including The Kremlin in Moscow, Dubai and Mumbai, India, Director Brad Bird (who had previously only directed animated movies like The Incredibles for Pixar) shows that he has a keen eye for action. The movie is well written and we get a nice mix of new technology and elaborate missions. The main actors seem to have good chemistry but Cruise is definitely the engine that powers the plot. Bird does a really good job of making the most of thrilling action scenes that contain large set pieces. He keeps the camera far enough away to let the audience experience the epic scope of the action. Put it all together and you have the best Mission: Impossible film of the series. This film is a must-see in theaters, especially in IMAX and . It's a tad too long and some of the sequences are entirely too unbelievable. You will definitley get your money's worth though and I'm sure we'll see Cruise globe-trotting once again as Ethan Hunt in a follow up film. I imagine Renner and Pegg will be back as well. A solid 4 out of 5 JRs for Ghost Protocol. NOTE: I saw this film out at the UDVAR HAZY Air and Space Museum in Chantilly. It's a fantastic place to watch a true IMAX film (most of the theaters in this area that claim to be IMAX are actually much smaller in screen size). The only downside is that you have to pay $15 to park there in addition to the $15 ticket price. 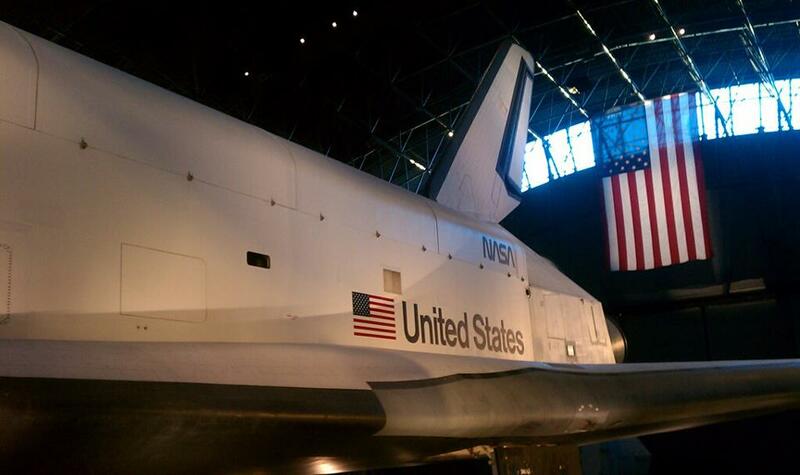 The $15 does give you access to the impressive collection of airplanes and space travel vehicles on display in the museum. Lesson learned this time around. Next time I'll either go with a group to split the parking cost or plan on visiting the museum before or after the show. I did make an impromptu visit after the film and saw the highlight of the exhibit, an actual Space Shuttle (pictured below).